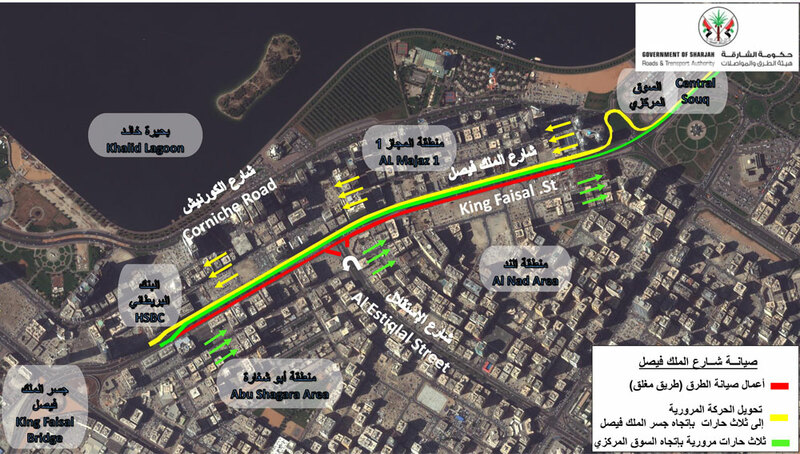 A part of King Faisal Street has been closed for traffic since yesterday (Saturday), and shall remain closed for the rest of the year as part of a maintenance work project, the Sharjah Roads and Traffic Authority (SRTA) has announced. On Saturday, a 2km-stretch of King Faisal Street connecting King Faisal Bridge and Union Square in the areas Abu Shagara and Al Qasmiyeh were closed in one direction, commencing the first phase of the project. Traffic heading towards Dubai along the iconic Al Majaz Lake has been diverted whereas commuters heading into Sharjah will be impacted in a few months. When the maintenance work in this direction has been completed, the Dubai-bound road will be re-opened and the Ajman-bound part of King Faisal will be closed for maintenance, explained an SRTA official. During the first phase of the project, motorists in the direction of Dubai will be diverted to the three-lane service road towards King Faisal Bridge, passing along Al Majaz community. The road has a total of six lanes in each direction, which will be refurbished in a project costing Dh11,004,000. Damaged parts of the road will be restored and the sidewalk in each direction will be restored. New road signage will also be placed along the road. This same weekend, maintenance work commenced on Sheikh Khalifa bin Zayed Road, another main road in Sharjah, leading to a partial closure between Thursday night and Monday . Last year, the Sharjah authority carried out similar maintenance work on Corniche Street, which forms an extension of King Faisal Street. Al Majaz area is known for its vicinity to the sea leg shaping Al Majaz lake and Al Majaz Waterfront, which is increasingly becoming a popular leisure destination.